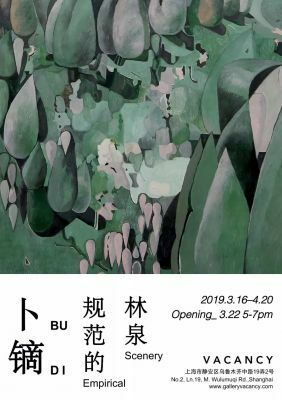 Gallery Vacancy is pleased to present Bu Di’s first solo exhibition Empirical Scenery in Shanghai from March 16th to April 20th in 2019. This exhibition attempts to reveal Bu Di’s inner landscape based on the architectural morphology of the gallery space. Through the transcendence from constructing representative scenery to creating abstract imagery, Bu Di’s painting is not only dialectically generated from his accumulated psychological experience, but also distilled from his thorough knowledge of Western painting and ancient Eastern art with his understanding of Modernism. Bu Di deconstructs the landscape, in terms of its form and potential dynamics, to explore how the embedded mechanism of his painting language emerges within the frame. Considering Bu Di as a solitary, ruminating discreetly while painting, and his practice as a way to escape the reality, He creates and expands that metaphysical space in Empirical Scenery for viewers to watch and wander through his otherworldly landscapes. Bu Di was born in 1970 in Beijing and now lives and works in Beijing. He reconsiders the construction and the narrative relation of painting with his recapitulative representation of image, and injects his understanding of Modernism and Chinese culture into his painting, alongside the reinterpretation of nature. In 2019, Bu Di will have his solo exhibition, titled Empirical Scenery, at Gallery Vacancy, Shanghai. Past exhibitions include: Déjà vu: Painting as the Art of Signification at Hive Center For Contemporary Art (Beijing, 2018); Bu Di 2016 at Hive Center for Contemporary Art (Beijing, 2016); and Bu Di Solo Exhibition at Xindong Cheng Gallery (Beijing, 2013).